Myers was born in Mandeville, Middlesex, Jamaica, the son of nurse Eulahlee Lee and machine technician Clifford Vincent Myers. In the early 1970s, his family moved to Mount Vernon, New York, where he was raised. In an interview, his mother stated that he spent most of his childhood hanging out with his brother Floyd and his childhood friend Mo. Heavy D & the Boyz were the first group signed to Uptown Records, with Heavy D as the frontman and only rapper. Eddie F was his business partner in the group, DJ, and one of the producers. The other two members, T-Roy and G-Wiz were the dancers. Their debut, Living Large, was released in 1987. The album was a commercial success; Big Tyme was a breakthrough that included four hits. "Trouble T. Roy" died at age 22 in a fall on July 15, 1990, in Indianapolis. Dixon's death led to a tribute on the follow-up platinum album, Peaceful Journey. Pete Rock & CL Smooth created a tribute to Trouble T. Roy called "They Reminisce Over You (T.R.O.Y.)" which is regarded as a hip hop classic. In 1989 Heavy D performed a guest rap on Janet Jackson's hit single "Alright". It and Blondie's "Rapture", recorded in 1980, were notably the first pop singles to feature a rapper, setting the trend for future hip-hop and pop collaborations. It was also the highest peaking song which he had performed on in the Billboard Hot 100. In 1992 he appeared on Michael Jackson's single "Jam". He gained even more fame by singing the theme song for the television program In Living Color and also MADtv. 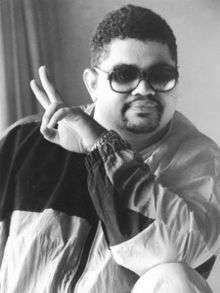 Heavy D then began focusing on his acting, appearing in various television shows before returning to the music charts with Nuttin' But Love. After appearing in the off-Broadway play Riff Raff at Circle Repertory Company, Heavy D returned to recording with the hit Waterbed Hev. In 1997, Heavy D collaborated with B.B. King on his duets album Deuces Wild, rapping in the song "Keep It Coming". Heavy D was referred to in the song "Juicy" by the Notorious B.I.G., and appeared in his music video for "One More Chance". While still an artist at Uptown Records, Myers was instrumental in convincing Andre Harrell to originally hire Sean “Diddy” Combs for his first music business gig as an intern. In the early 90s, he is also credited for convincing Andre Harell to sign Jodeci. Then, also to his credit, in the mid-1990s, Myers became the first rapper to head a major music label when he became the president of Uptown Records. During this time, Myers also developed the boy band Soul for Real, and was the executive producer and principal writer of several songs on the group's breakout album, Candy Rain. He later became senior vice president at Universal Music. He fathered a daughter in 2000 during a relationship with chef Antonia Lofaso, a contestant on the fourth season of Top Chef. Heavy D and Eddie F performed at the 2011 BET Hip Hop Awards on October 11, 2011. It was their first televised live performance in 15 years and would be his final live performance. Myers died on November 8, 2011, in Los Angeles, California, at the age of 44. He collapsed outside his home in Beverly Hills, California, and was taken to Cedars-Sinai Medical Center. His death was initially thought to be connected to pneumonia. An autopsy report, released on December 27, 2011, stated that the cause of death was a pulmonary embolism (PE). The coroner's office found that Myers died of a PE that had broken off from a deep vein thrombosis in the leg. He also suffered from heart disease. Craig Harvey, chief of the Los Angeles County Department of Coroner, said that the blood clot that resulted in the PE was "most likely formed during an extended airplane ride". Heavy D had recently returned from a trip to Cardiff, Wales, where he performed at a tribute to Michael Jackson. Shortly after his death, MC Hammer and others led tributes for Heavy D on Twitter. Hammer tweeted, "We had a lot of great times touring together. He had a heart of gold. He was a part of what's good about the world." A Different World episode "Delusions of Daddyhood"
Tales from the Crypt episode "On a Deadman's Chest"
"Bones (TV series) Bones" episode "The Man on Death Row"
Bones episode "The Man in the Fallout Shelter"
Tyler Perry's House of Payne episode "Dream Girls"
Law & Order: Special Victims Unit episode "Personal Fouls"
↑ Caramanica, Jon (November 8, 2011). "Heavy D, Smooth Rap Star, Dies at 44". The New York Times. ↑ "Heavy D Biography (1967-)". Filmreference.com. Retrieved 2011-11-08. 1 2 Caramanica, Jon (November 8, 2011). "Heavy D, Smooth-Talking Hip-Hop Star, Dies at 44". The New York Times. Retrieved November 8, 2011. ↑ "Heavy D- The Overweight Lover to Notorious B.I.G. - DJsRock.com - Free Mixtapes – Hip Hop Website". DJ's Rock. April 19, 2012. Retrieved April 16, 2014. ↑ "Rapper Heavy D Dead at 44". Billboard. November 8, 2011. Retrieved April 16, 2014. ↑ Shapiro, T. Rees (November 9, 2011). "Heavy D, hip-hop's self-described 'overweight lover,' dies at 44". The Washington Post. Retrieved November 14, 2011. ↑ Kennedy, Gerrick D.; Jackson, Nate (November 9, 2011). "Heavy D dies at 44; singer who shaped rap music". Los Angeles Times. Retrieved November 14, 2011. ↑ Sean Michaels (November 9, 2011). "Rapper and actor Heavy D dies aged 44". The Guardian. London. Retrieved November 9, 2011. 1 2 Angel Jennings (December 27, 2011). "Heavy D died from blood clot, coroner finds". Los Angeles Times. Retrieved December 28, 2011. ↑ "Mc Hammer | Tributes Pour In For Rapper Heavy D". Contactmusic.com. Retrieved 2012-10-17. ↑ Alanah Eriksen (2011-11-09). "Heavy D dead: MC Hammer leads tributes for Now That We Found Love rapper | Mail Online". Dailymail.co.uk. Retrieved 2012-10-17. ↑ "The Fresh Prince of Bel-Air Episode Guide". www.epguides.com. May 14, 2005. Retrieved April 14, 2012.